A college student or a couple just starting out in a small apartment will appreciate this miniature food processor from Proctor Silex. With a 1.5-cup bowl, it holds just the smallest portions of food, but that’s plenty for one or two people. 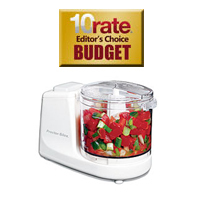 The food processor cuts down on kitchen time by effectively chopping up vegetables, fruits, meats, nuts, and chocolate. Perfect for preparing a quick dip or a smoothie, this model has a fresh, modern design and is easy to use and clean. Best of all, it’s available for only $18.49.